How do I measure the size of my awning? Size is measured as the distance from the center line of one awning arm to the center line of the other arm. This measurement is in whole foot increments. The actual fabric will measure approximately 10″ less. 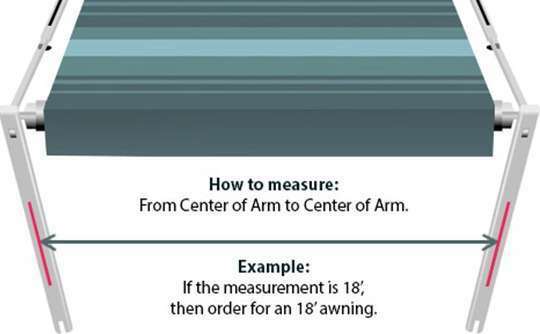 If the measurement of the distance between center line of arms is 16 ft, then you will need to order a 16 ft awning fabric. For a 16 ft awning, the actual width of the fabric is between 15’1″ and 15’3″. What is Sun-Wave fabric made of? The canopy is made of 15 oz. tri-laminated durable vinyl. Both sides are colored. A white 16 oz. 1000 denier heavy-duty weather-guard is welded on the top to protect the canopy when the awning is rolled up. Major brands use 13 oz vinyl for the canopy and 14 oz. vinyl for the weather-guard. Which awnings do the fabrics fit? Our fabrics fit all Carefree, Carter, and Dometic A&E roll-up type patio awnings. The fabrics will not fit the awnings with metal wrap (for these awnings, when you roll them up, you can see that the awning fabric is wrapped by an aluminum cover) . What if I don't know the awning brand? To make sure our fabric fits your awning, you need to check your awning roller profile. If your awning roller has three grooves and the opening of each groove is 5/32″ or less, you can use our fabric. The full extent of our awning replacement fabric is approximately 94-96″. Before purchasing replacement awning fabric, you need to make sure your awning arms have enough extension. Do I need to buy anything extra before installing the awning fabric? The replacement fabric (canopy and valance) is completely finished. There are 3 cords used for attachment with the fabric. The cord with the 1/4″ diameter will connect the canopy onto the trailer. The two cords with the 3/16″ diameter will secure the canopy and valance onto the awning roller. A Pull-Strap is included in the package. Do you have instructions for replacing the awning? We have included basic instructions on our website. Since structurally our awning fabric is 100% identical to the major brand’s fabric, you may use their product manual as a guide for installation. You can request installation instructions from the manufacturer of the awning or download a manual from their website. What's the shipping cost for my order? All of our awning replacement fabrics are sent out via UPS Ground at a flat rate of $19.00. All of our awning hardware and accessories will be sent out via USPS Priority mail. For products shipped to Canada, Puerto Rico, and Alaska we charge a flat rate of $79.00. Products shipped to these locations will be shipped via USPS unless the customer requests UPS in order notes. Most orders will be sent out via UPS ground the same or following business day after receiving the payment. Once your order is sent out, you will receive an email notification. Most customers will receive their order within 6 business days. We have a 30 day return policy — merchandise can be returned within 30 days if you are not satisfied. The returned item must be in the original condition and in the original package. The original packing-slip is also needed. Product must be inspected on a clean dry surface upon receiving. We cannot accept a return if the product has been installed. Once fabric is installed it is under warranty. The buyer is responsible for the return shipping costs. There is a 20% restocking fee on returns. We offer a 3 year limited warranty. Warranty is on MOST of our RV Patio Awning Fabrics (this does not apply to ‘Sale Specials’ unless noted). We offer a 2 year warranty on our Slide Out Cover Fabric. Each fabric has a product specific description that will provide you with details of the fabric you are ordering. Warranty is for fabric only, NO labor. Canadian Customs requires Canadian recipients to pay applicable duties and taxes on each shipment entering Canada. Your order will be shipped under UPS’s e-Tailer brokerage Program (eBP), where eligible shipments imported into Canada for non commercial purposes and valued under CAD $200 shipped via UPS Standard service are subject to a reduced brokerage fee of CAD $10 plus any applicable duties and taxes. Shipments valued at CAD $200 and above and being imported to Canada for commercial purposes and/or subject to specialized clearance may incur additional fees. If you are a Canadian or Australian dealer/distributor and would like to work with our product please contact us at (574) 966-5698 for details.